"What is Baklava?" and "The History Of Baklava"
Baklava is a Mediterranean dessert made with Phyllo dough, nuts, butter, and sugar. After baking to perfection, a sweet syrup is immediately poured over the pieces allowing the syrup to be absorbed into the layers. We use highest quality walnuts and Grade AA butter, and we make our own syrup for our Baklava. Our baklava has earned rave reviews from our clients. Please read testimonials from actual customers who often say that our baklava is the best baklava they have ever tasted. Why not try for yourself? Order baklava today. Our baklava is especially noteworthy because it contains top grade california walnuts, certified to be high in Omega-3 fatty acids. containing more of this desirable ingredient than any other nut. Our walnut baklava contains these GOOD ingredients. Sweet and good for you: That's the best of both worlds. Order our baklava today. Some baklava contains walnuts. Other variations include pistachios, pine nuts, almonds, or other nuts common to the Mediterranean and the Middle East. In many countries, baklava is an excellent compliment to coffee. Baklava is used in weddings, family get-togethers, and various other feasts and celebrations. We are glad to fill your baklava order quickly and efficiently. Many groups claim Baklava as their own. However, a check of the history of baklava yields surprising results. It is widely believed that it is of Assyrian origin. Around approximately the 8th century B.C., Assyrians baked thin layers of dough with nuts, poured honey over it, and enjoyed this sumptuous treat. Baklava was baked only on special occasions, usually by the rich who could afford such a luxury. A poor man used to exclaim, "I am not rich enough to eat Baklava in my house." Things have changed over the years. Now, you can order baklava anytime and you do not have to be a millionaire to enjoy the great taste. Ancient Romans and other cultures threw walnuts instead of rice at weddings because they believed walnuts held aphrodisiac powers. They also used in in fertility rites. On a side note, chick peas (garbanzos) are also viewed as an aphrodisiac for men. Chick peas are the main ingredient in hoummous (hummus) bi tahini. Pine nuts have also been viewed as an aphrodisiac for over 2000 years. Whether these three foods help you or not, they are a very tasty part of the ingredients we use to make our Lebanese food. The history of Baklava changed with the history of the land. The Near and Middle East saw many civilizations come and go. Baklava and the recipe had spread to the Near East, Armenia, and Turkey. With the advent of the Grecian Empire, it spread westward to Greece. Phyllo dough is named after the greek word for "leaf", being "as thin as a leaf". The thickness (or for that matter, the thinness) of Phyllo gives baklava is delicious crispy taste. So, when you eat a piece of baklava, you may want to think of Greece. However, the history of baklava reveals it came from farther East... Even so, various countries offer tasty variations and have loyal followings. The history of Baklava - as colorful as the History of the lands of the Mediterranean and the Middle East. Walnuts Clinical Scientific Update: Mounting scientific research shows health benefits of walnuts, especially heart-healthy omega-3s. The U.S. Food and Drug Administration (FDA) has affirmed the health claim, "Supportive but not conclusive research shows that eating 1.5 ounces per day of walnuts, as part of a low saturated fat and low cholesterol diet and not resulting in increased caloric intake, may reduce the risk of coronary heart disease." This FDA decision comes in response to a petition filed by the California Walnut Commission, which highlights a body of international scientific research substantiating the specific benefit of consuming walnuts as part of a heart healthy diet in reducing the risk of heart disease. The body of evidence suggests that the nutritional composition of walnuts contribute to these heart health benefits. Is Baklava Healthy? Can it be guilt free? Since Walnuts contain "the GOOD fat", they can be part of a guilt free dessert. Walnuts are high in Omega-3 fatty acids, containing more of this desirable ingredient than other nuts. Click here for a comparison chart. 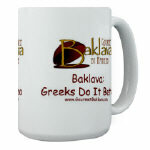 "Baklava: Greeks Do It Better"